Rosiline Floyd knows about overcoming challenges in her life, and she learned about other women doing the same. Floyd graduates May 9 with her doctorate from Indiana State University and in her research she concentrated on others who are also overcoming challenges. In a small sampling of students at three universities, she found black women encounter racism on predominantly white campuses but that belonging to a black sorority, formally known as a women's fraternal organization, helped them to stay in college and achieve their goals. During Floyd's doctoral studies in educational leadership, administration and foundations, she discovered that 46 percent of black women entering college complete their degrees versus 66 percent of white women. That led her to examine her own life and the lives of other successful black women. "I came back to myself. I'm from teenage parents, from an inner-city school, I did not get the best education," Floyd said. "I said what kept me in school? It was the relationships I developed with the sorority." Mary Howard-Hamilton, Indiana State professor of educational leadership, administration and foundations and author of "Standing on the Outside Looking In: Underrepresented Students' Experiences in Advanced Degree Programs," said Floyd's research is groundbreaking because there is little written about the experiences of black women on predominantly white campuses or the link between retention of black females and black Greek letter organizations for women. "There are numerous articles about the negative impact of sororities and fraternities such as alcohol abuse, hazing and attrition," Howard-Hamilton said. "However, the positive aspects are rarely discussed and the conversation that can be started is how can colleges and universities be more supportive in retaining these organizations on campus." Floyd's research allows women to be examined as an individual group. "Overall this study adds to the literature base on black Greek letter organizations and it gives women a voice and provides a within group source of information rather than lumping all of the issues under one large category 'black Greeks,'" Howard-Hamilton said. 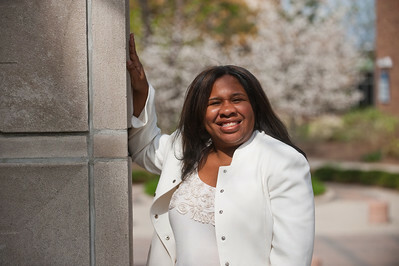 For her doctoral research, Floyd interviewed members of the Alpha Kappa Alpha, Delta Sigma Theta, Zeta Phi Beta and Sigma Gamma Rho sororities at Indiana State, Indiana University and Purdue University. "I never expected race to play such a major role in the research," she said. "These women left me crying and laughing and hurting to think they went through some of the things I went through." Her research showed that race and racism substantially impacted the post-secondary experiences of the women. Besides the traditional adjustment to college, Floyd said the women perceive race and racism as a part of everyday life at predominantly white institutions. "'Race overwhelms everything,'" Floyd said one student told her. The women spoke of classroom demographics in which they were the only black student in a class or professors ignoring them unless the subject dealt with race, Floyd said. One student said university officials contacted black students for video or brochure shoots, but not in regard to university-wide policies and procedures that affect students such as social organization fees. "The women reported constant efforts to deconstruct stereotypes including the need to be in class on time, refrain from actions that could be perceived as 'ghetto' and the need to control reactions when confronted with overt racism," Floyd said. The female students in Floyd's study said class group projects were among the most uncomfortable part of their collegiate experiences because group projects forced interactions between the races. "For the women, group projects meant dealing with stereotype assumptions of that because she is black 'she is only going to do the minimum,'" Floyd said. "One participant described forcing herself to be the group leader to avoid being ignored." Students from the three universities also spoke abut racism they encountered including a noose hanging and other students voicing negative opinions of black people. Floyd also found the women did not perceive race as an obstacle but that "being black made them stronger" and they took strength from their organizations founded by black women and related to the founders for historical and contemporary role models. That connection helped them to maneuver past their racially inflicted wounds. One student was vice president of the student council in junior high when a person called her the "N word," Floyd said. "It just shattered everything that she was. She said what the sorority did for her is teach her she has a path," Floyd said. "Everybody has a path. I may be different but it's my path." Belonging to a black Greek organization helped members enhance self-esteem and self-beliefs, Floyd found. "The sisterhood replaced loneliness and isolation with a group of critical friends to support, inspire and redirect," she said. Floyd's journey took her from the Meadows housing project in Indianapolis to a degree in engineering and a master's of business administration before turning toward education. "Sometimes God gives you directions and you ignore them," she said. "Even as a little girl I was a tutor so I think I was probably supposed to be a teacher." Although she doesn't teach, she works with students at Arlington High School in Indianapolis as a consultant through Outlook University Independent School Network, which partners with at-risk students to help them with their educations. "Where would we be if Martin hadn't fought?" Floyd said. "Where would we be if Malcolm hadn't fought, if Rosa hadn't sat?" Floyd learned about overcoming obstacles as a child when she encountered racism on a daily basis. She was part of the first group of black children bused to a white school in Indianapolis. Each day when they would arrive, Floyd said they were greeted with hatred by white parents. "Because we were bused, we were ostracized and cussed out every day," she said. "But because we were bused, we had a lot better facilities than the ones we had in the inner city." Eventually, Floyd said, her mother transferred her children to another school where she became part of the gifted and talented program. That opened Floyd's eyes to new possibilities for the future. "I was introduced to students whose parents were doctors and lawyers and nurses. I wanted to have a career where I said 'I am a' instead of 'I work at,'" she said. "Because of that when I started reading about the negative statistics for college graduation for children from low socio-economic backgrounds and students of color, I thought, 'Oh goodness, we have to do something to change.' I thought about if they don't get an education where are they going to be? They're going to be some people who 'work at' instead of have a 'career as.'" Floyd joined the Delta Sigma Theta Sorority as an undergrad at Purdue. There she said she received support from her sorority sisters as she worked toward a degree in engineering. "What it did for me is the same thing that my findings show is that there is someone to talk to who understands your struggles," she said. After working as an engineer, Floyd found she disliked doing the actual design work and became the company's product tutor and trained others. That changed when her then 15-month-old daughter went into a diabetic coma. "I was traveling all the time for my job and I had to find something so I could be at home," she said. She had started attending an MBA program at Indiana Wesleyan University and found a job teaching algebra at Ivy Tech. "I really enjoyed teaching people who wanted to learn," she said. It also confirmed her desire to work in education and help people make changes in their lives. After finishing her master's degree, Floyd turned toward a career in education. She began working on her doctorate at ISU in 2004. "I never felt like I fit in (at universities) until I started taking classes here," she said. "When I started taking classes I found people who think like me." On Saturday, May 9, Floyd's ISU journey comes to an end as she is hooded for her doctorate degree. Family members from five states plan to journey to Terre Haute to watch the graduation ceremony and cheer Floyd's accomplishment. Her parents who championed education now get to see their daughter reach the pinnacle of higher education. "They're very, very proud," she said. "My family is very, very excited." Floyd has already turned her attention to the future, and working with students. "It's a much richer feeling than being at some company as an engineer when you change the lives of people who have lost hope," Floyd said. "I think that's my goal in life to change the lives of people who have lost hope or don't know how to hope." In a small sampling of students at three universities, an ISU doctoral student found black women encounter racism on predominantly white campuses but that belonging to a black sorority, formally known as a womenÃ¢â‚¬â„¢s fraternal organization, helped them to stay in college and achieve their goals.